In the northwest of Laos, bordering China along the Phou Mountain Range with Boten as a border crossing, and Burma along the Mekong River, lies Luang Namtha, what is a town and also a province. 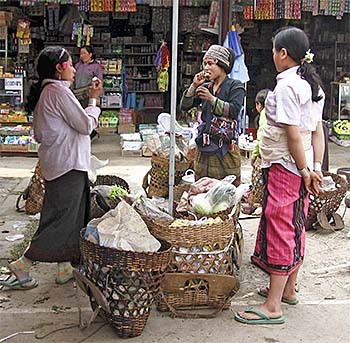 The town is, despite it's small size and population of merely 3,500 people one of the biggest places in the north of the country; it is also the capital of the province Luang Namtha. The province's population is around 150,000 people. It ows it's name to Tha River (Nam Tha). Luang Namtha is a traffic hub in the north, connecting Chiang Khong (Thailand) over the new Mekong bridge via Houayxay at the Mekong River with south China, following the newly improved road 3 (Asian Highway 2). 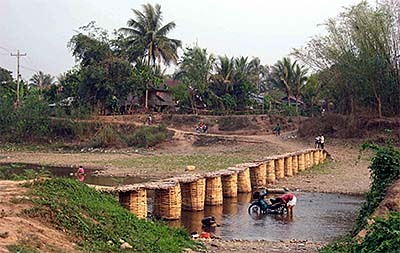 It also connects remote Muang Sing with the neighbouring province Oudomxay. The place has even an airport. The bus station is a particularly poor example of traffic disorganization in nowadays Southeast Asia. It's about 12km out of town, so that additional transport is mandatory after arrival. There is some boat traffic on the river Nam Tha, where boats go to and fro the Mekong River. Luang Namtha has actually two, if not three parts of town. The old town lies closely south of the airport. It was havoced in the American Vietnam War. The place was also vulnerable to floods, so that it has been moved a few kilometers northwards. Not far from that eastwards along the river banks are more local dwellings who look much more traditional - it's the old style bamboo shacks. The local economy is weak. Traditionally, the people here live from the usual agriculture. They produce also silk, paper and do other handicrafts. A bit trade along the newly improved highway with it's growing traffic helps a little. The province is also target for ecotourism into Nam Ha nature reserve, where a patch of rich tropical rainforest has still survived. There is much wildlife around here, among it bears, gibbons, macaques, muntjacs and allegedly even tigers. The wildlife is, traditionally and still, part of the local economy, and hunting and poaching happen. Much of the area has fallen victim to big agricultural investment, probably most of it from China, transforming the natural forests into green deserts like sugar cane and rubber plantations. That means threat and extinction to many species. There are coal mines operated in the mountains. Viengphoukha Coal Mine Co. Ltd. is exploiting lignite, copper mining happens as well as wood processing. 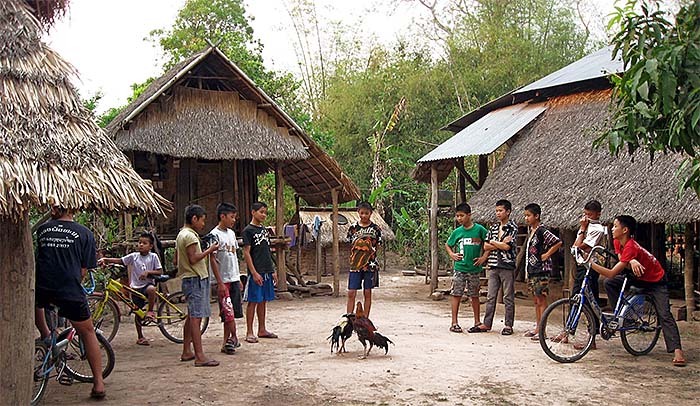 Since the most people living here and in the surrounding mountains are hill tribes, also ethnotourism happens here. There are around twenty temples in town and, meanwhile, the place even has a small museum. The human record in the place dates allegedly back about 6,000 years. In middle-ages, Luang Namtha was part of Lanna until it was conquered by Burmese troops in the 16th century. It remained under Burmese control until the 19th century, when it came to Siam. In the 1893 border deal the French forced Siam into, the place and area was added to French Indochina. A battle in the American Vietnam War happened in Luang Namtha. This article is based on two visits to Luang Namtha. It's supported by a number of publications. You find a list of them on the Literature page. It comes together with uncounted articles from newspapers, magazines, (qualified) websites and movies, both fiction and documentary.